Just like you update your wardrobe every winter, why not change your hairstyle too? Julie Robinson, the international master barber, tells us what’s hot this season. “Today, we’re seeing men’s hairstyling fashion heading back towards the convention of traditional cuts. 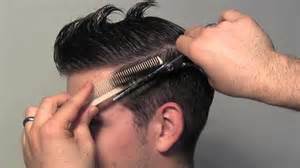 But at the same time, men are becoming more experimental with weight lines and hair lengths in their cuts. This amalgamation of styles produces exciting possibilities and leads to modern and versatile haircuts, which retain tradition but can be worn in a number of different ways.“ Here are five trendy winter haircuts, as worn by your favorite celebrities. Currently, in vogue, this hairstyle is a distant cousin of the undercut. In skin fade, the sides are clipped to the maximum, so much so that the hair pretty much disappears into the hairline. The hair is cut short around the crown, then, working forward, directed and pulled back towards the crown to maintain length at the front. Sport this look, if you want to hide a receding hairline! For a bolder look, go lighter by using hair color. If you want to be slightly more discreet, use a darker color. Beckham brought this haircut back in vogue when he sported it at the Royal Wedding. This style is created by tightly clipping the back and sides while leaving length at the top. It gives a tight line around the ears and the nape of the neck as the hair is faded below the curve of the head. Alternate versions of this cut are created by the hair being clipped higher into the curve of the head, to produce a much more dramatic look. The longer hair on top is then swept back with a parting. Looking for a vintage swept-back hairstyle, that won’t budge but also doesn’t look too unnatural? If yes, go for the casual sweptback look. The length of the hair should be 2 inches all around; ensure that the edges are left very natural. Texturing the tips all around would apply a softer finish. It is the perfect after-work or weekend look, for when you want to look relaxed but on trend. Ombre tips look great with this style because they reflect the light at the top of your hair for a subtle warm glow. Also known as Caesar crop, where the hair is cut short on the sides and back, while the top and front sections are kept a little longer, usually worn as a fringe. For a formal occasion, you can neatly comb back your hair from the front. For a more laid-back and casual look, just leave the front hair loose and use your hands to push them back when they fall on your forehead. It is the perfect hairstyle for men working in the corporate and government sectors.